Almost half of Which? 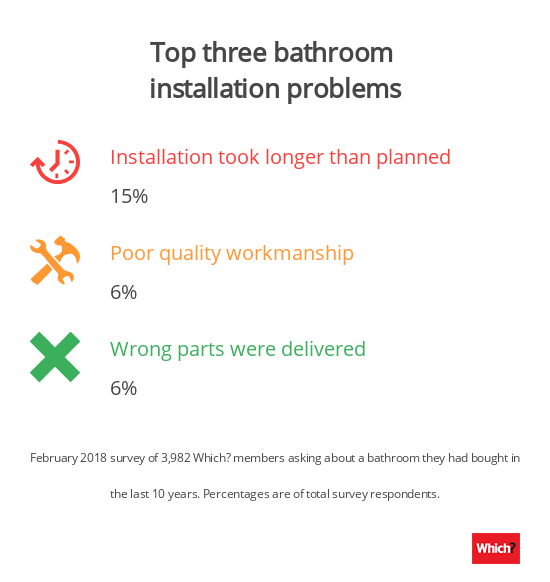 members have complications when buying new bathroom components, and 38% run into problems when having a new bathroom installed, according to a recent survey. We asked 3,982 Which? members to tell us how their most recent new bathroom renovation had gone. Of those who had complications with the components they’d ordered, toilets were most often what caused the hold-up. 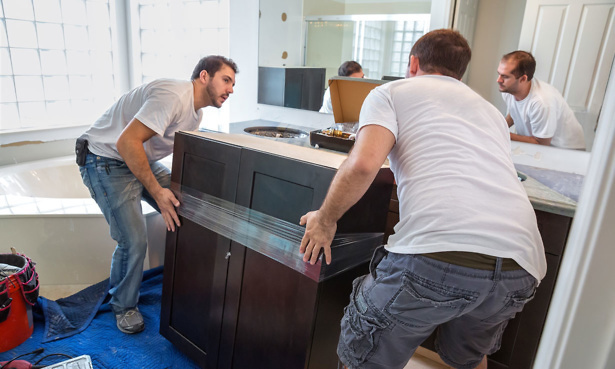 When it came to bathroom installation, the most common complaint was that the work took longer than originally planned. Read on to find out the top problems our members experienced and quick tips to help you avoid them. 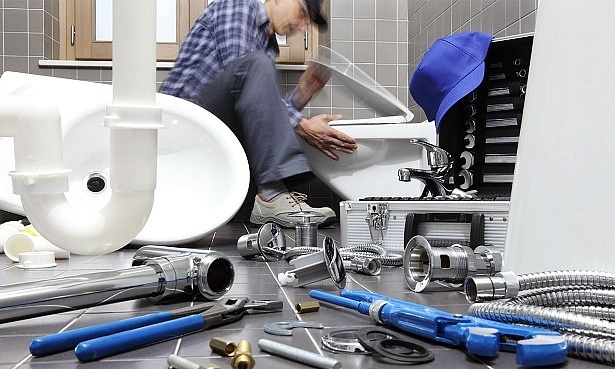 If you’ve been unlucky enough to have something go wrong with your bathroom fitting, we’ll also explain how to resolve the problem. 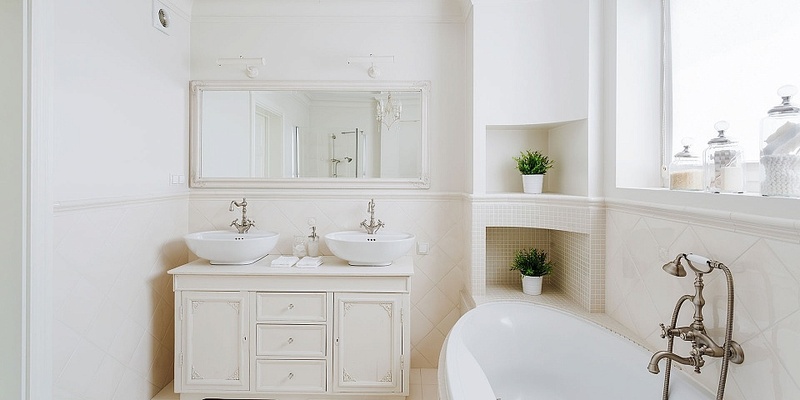 If you’re in the process of buying a bathroom, head to our bathroom reviews to find out how customers rate companies such as Victoria Plum, Homebase and Bathstore. Other problems were related to flooring (4%), tiling (3%) and vanity units around the sink (3%). When you’re shopping for bathroom components, look out for the CE mark, as this shows that the product has been tested and is ‘fit for purpose’. Also check whether the company you’re buying from is part of a recognised body, such as the Bathroom Manufacturers Association, as they’ll have to meet certain standards. You can also use our bathroom reviews to see how customers rate brands for quality of products, customer service, value for money and durability. 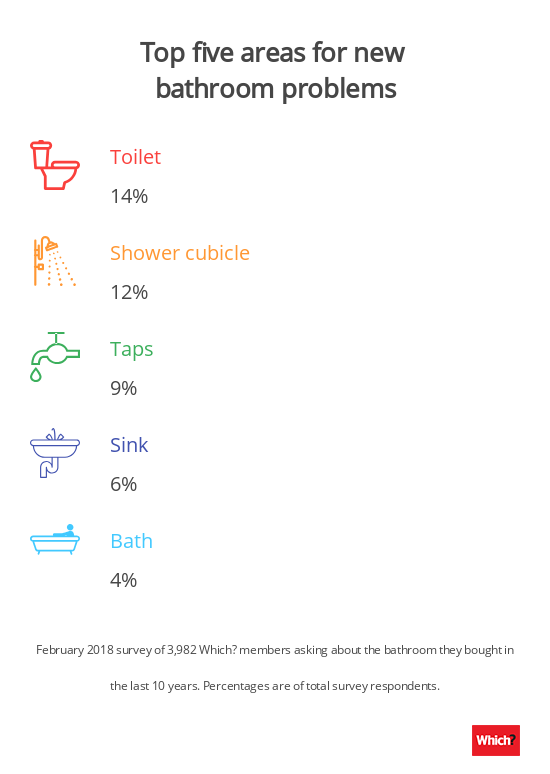 Our survey also found that 38% of members had had trouble with their new bathroom installation. components not fitting as well as they should (4%). 41% of the people we surveyed used an installer they found themselves (most likely an independent trader). 30% of people used the company from which they bought the bathroom to install it. Before you commit to a bathroom installer, take a look at our bathroom installation page. It reveals customer ratings for three big-name companies, alongside independent traders. To find a reputable independent trader in your area, head to Which? Trusted Traders. All our traders have been through background checks and are signed up to our code of conduct. For most people (40%), it took between a week and a month to have their bathroom delivered and installed. 8% got it done very speedily – less than a week from start to finish. For 28%, it took between one and two months, and for 15%, a drawn-out two to three months. It can take longer if you’re getting bespoke pieces made or order parts that aren’t readily available. Other reasons for a slower process can include a complicated installation. When you agree to your new bathroom, make sure the company you order it from gives you in writing a time frame for delivery. This should encourage them to stick to the deadline. If you’re using an independent fitter, make sure they are aware of the timings you’ve been given. For most people (32%), the problem they’d encountered with their new bathroom component was resolved within a week. But for an unfortunate 23%, the issue was yet to be resolved at the time of the survey. Of satisfactory quality: They shouldn’t be faulty or damaged when you receive them. Fit for purpose: They should be fit for the purpose for which they were supplied. As described: They must match the description given to you, or any models or samples shown to you at the time of purchase. If what you’ve bought doesn’t satisfy any one of the three criteria outlined above, you have the right to make a claim under the Consumer Rights Act. Your rights are against the retailer – the company that sold you the product – not the manufacturer, so you must take any claim to the retailer. You’ll need to do so within 30 days of taking ownership of the product. After 30 days, you will not be legally entitled to a full refund if your item develops a fault, although some sellers may offer you an extended refund period. The Consumer Rights Act also applies to services, including bathroom installation. A trader must perform the service with reasonable care and skill. If they don’t, you’re entitled to have the work redone within a reasonable time, at no extra cost to you. Find out more in our full guide to complaining if you have a problem with a home improvement.